You have been a committed believer in the Lord Jesus Christ for considerable time now. Your life has changed positively, and you became a different person. You have been baptized in water. You have been active in your church community. You love the Lord and His atoning work on the cross with all your heart. So the last thing you need now is someone challenging your beliefs. I can understand that. But sometimes in the Christian life our will may differ from God’s will, and I believe it is the will of God that you are reading this. Our faith can only grow through trials and times of testing. And if you are willing to grow in Christ, this letter is for you. These words however are not intended to attack or insult you. Nor is the aim to put a wedge between you and your faith, or to sow discord in your local assembly. This is a time for earnest prayer, and a careful and thoughtful approach to understanding our shared Christian faith. Because the times are difficult. Christianity in the west, especially in Europe, is in decline. Despite high immigration levels keeping traditional churches afloat, the overall picture is bleak. Biblical morals are under attack on a global scale. In the churches, standards of holiness and doctrinal purity are slipping away fast. Foreign religions are on the rise. Many western children grow up not even knowing the basics of the Bible and the Lord Jesus Christ. Millions are setting themselves up for empty and sinful lives which are focused on entertainment and self-indulgence. In Christian families we can also see worrying developments. Many Christians are struggling to really follow Jesus. They are forced to live as the Jews in Babylon. Their faith is constantly under attack from atheism and false beliefs. Many are spiritually weak. They lack a firm doctrinal foundation. They go through the motions of church but do not experience the transforming power of Christ. It has been a long time since they last felt the fire of the Holy Spirit. They are not able to pray or fast much. A certain level of worldliness and dryness has entered into their walk with the Lord. Perhaps you are one of these Christians. Or perhaps you still consider yourself to be on solid ground. In any case, we should not be afraid to test if we are in the faith (2 Cor 13:5). The Bible encourages us to investigate the fruit of Christ in our life. God has allowed you to believe the gospel and share it with other people, and perhaps even to minister for Him. This is undeniable fruit, which I believe is written in heaven. It is a great privilege to serve the one true God Jesus Christ. Matt 18:16 But if he will not hear thee, then take with thee one or two more, that in the mouth of two or three witnesses every word may be established. 2Petr 1:20 Knowing this first, that no prophecy of the scripture is of any private interpretation. It is on the principle of sound doctrine that I would like to share this message from the Word of God. God loves you, and He has used you for many years now. But there exists what the Bible calls the perfect will of God. That is why the Spirit of God has prompted me to write this message. It is about the doctrine of the apostles as it was written in the scriptures. I humbly request and pray that you will consider these lines, as understanding them could potentially bring great blessings. I have two messages for you. As a Christian you have given your life to Jesus Christ. It is only Him that you worship, and only His name is the name above all other names. You will not accept any other god or gods beside Him only. Jesus, through His Word, made it clear to you that He is the great I AM, the image of the living God. The Bible says that if you see Jesus, you have seen the Father, for the Father is in Him (John 14:10-11). It is all the more surprising then that you openly confess a belief in the theological Trinity. For the doctrine of the Trinity claims that the Father is outside of the Son, and they are only the same in essence, but not in identity. Probably you are familiar with the historical background of the doctrine of the Trinity, and how it was gradually developed by Christian thinkers and philosophers (sometimes called church fathers). Because of their efforts, the church doctrine gradually digressed from the Bible and adopted this speculative theology. So how did the strict monotheism of the Jews change into the worship of God as three distinct persons? Unless you understand this development, your faith may ultimately turn out to be in vain. This process started in the late second and early third century with men like Justin Martyr and Tertullian. Justin (who came from a pagan background and was trained in Greek philosophy) tried to separate the Word of God from God into two distinct beings in his writings. This is called the logos doctrine (not to be confused with John 1:1’s Logos). He relied on his knowledge of neo platonic thinking, where God was considered unmovable and impassionate with regards to suffering. Another church father, Tertullian, a lawyer from Carthage, was the first to use the term “trinitas” when he referred to God as three persona. This reveals the elitist mind of these church doctors. In contrast, the Jews considered the Word of God to be identical to God. For them, the Word of God is God Himself in action (Gen 3:8). When God speaks, He is not a different person from His own Word, just as your voice is not a different person from you. Being one God believing Jews, the apostles never preached that the Word of God was a distinct person from God. Neither did any of the apostles ever teach that God is unity of three distinct persons. The distinctions between Father and Son they recorded in the Bible are distinctions of titles, glory and roles, but never of personal identity, for else we would have two Gods. Church father Origen also played an important role in the development of the Trinity. He invented the theory of the “eternally begotten Son” in the third century. The idea that the Son is eternally born from the Father is a theological innovation that helped resolve the contradiction between the Son’s eternity (Micah 5:2) and the Son’s actual birth some 2000 years ago (John 1:14). But the flesh of Jesus is not past-eternal, only the Spirit is. The flesh of Christ was begotten of the Father in our time and space (Ps 2:7). Without these carefully crafted extra-Biblical constructs by Justin, Tertullian and Origen, the Trinity would have remained a theological oddity. The Bible does not support it at all. God took on the title Son when He manifested in the flesh as Jesus. The Old Testament contains much prophecy referring to that event. But the Son is only eternal as the Word of God, but not as God the Son (a term that is not in the Bible). That is why the titles Father and Son are mainly to be found in the New Testament. Many Trinitarian theologians further contributed to the gradual development of the dogma. They relied heavily on extra-Biblical concepts borrowed from Greek philosophy, such as homo-ousis (essence) and hypostasis (person or identity). They weaved these ideas into their understanding of scripture. Tertullian states in his third century tract “against Praxeas” that while the simple Christians believe that God is numerically one, educated people like him know that He really is three in number(!). In a bizarre twist, some of these theologians were later condemned as heretics due to their other speculative beliefs (Origen for instance believed that the devil would be saved, and Tertullian joined the ecstatic sect of the Montanists). But without their determined adoption of neo-platonic philosophy, the doctrine of the Trinity would never have made it into mainstream Christianity. Around 300 AD, the Trinity was still not finalized. For one, the official version did not have a clear role for the Holy Ghost. Only Father and Son were classified as distinct persons. 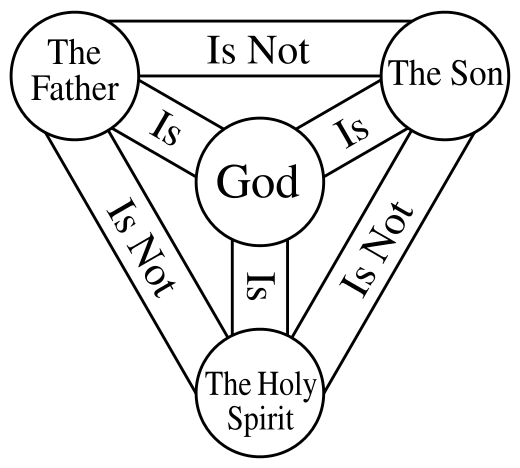 In fact the earlier form of the Trinity had a distinct Arian flavor to it, as the Father and the Logos were placed in a hierarchy. It was not until 325 AD at the council of Nicaea that emperor Constantine coerced the assembled bishops into signing a hastily drafted text that was to become the (in)famous Nicene creed. The text was mostly a political attempt to enforce unity. It however failed to clarify anything, and employed unbiblical terminology such as God from God. In the Nicene creed we can recognize the two Gods that the theologians desired ever since the time of Justin Martyr (God the Father as the platonic unmoved mover and God the Son as the divine logos, forever emanating from the Father). Between 325 and 381 AD, the three so called “Cappadocian fathers” completed the doctrine. They designated the Holy Ghost to be a third member of this celestial committee of three hypostases, and made them all coequal and coeternal. Emperor Theodosius I declared the Trinity a church dogma in 381 AD at the council of Constantinople. This new alliance between church and state kick started the first systematic persecution of Christians by other Christians. It was forbidden to have any other doctrine at the threat of expulsion and even death. The rest is history. I do not need to repeat the ugly blood soaked history of Trinitarian Christendom that ensued for the next 1600 years until the time of the reformation. Is 6:1 In the year that king Uzziah died I saw also the Lord sitting upon a throne, high and lifted up, and his train filled the temple. Trinitarians will make the claim that the three persons can speak and act as a single person. But this is profoundly illogical as such thinking introduces a whole new concept of individuality and obfuscates the meaning of personal identity. The concept of self would become meaningless by blurring the lines between I and we. God’s personality would not make much sense anymore, as He would be alternating between a plural and a singular state. If so then God could be accused of playing ontological tricks on His subjects. It is no wonder that many Trinitarians admit to the incomprehensibility of the Trinity and conveniently call it a mystery. This complicates matters even more, as God’s revelation to mankind would be just another mystery. But the Bible says that the mystery is manifested to the saints (Col 1:26, 1 Tim 3:16). Despite the mystery they also claim that one must believe in the doctrine in order to be a proper Christian. However, the apostles never commanded converts to believe in the Trinity. They called on people to believe in Jesus Christ as Lord and Savior. If the Trinity is really that important, the apostles would at least once have clearly explained that God eternally exists as three coequal and consubstantial persons Father, Son and Holy Ghost. But they haven’t. He created, not we created. The Hebrew language often uses the plural form to refer to something singular, like Elohim (plural) refers to a single God (Him). Elohim therefore does not imply many gods or persons. “Let us make” could plausibly refer to Gods heavenly court or represent His majestic glory. If God were a Trinity, why is Adam, who is created in His image, a single person? To argue that “let us make” must be referring to three persons, is a form of special pleading. Plurality does not imply a trinity. A Hindu may use the same verse to prove the 33 millions gods from his religion. The fact is that for the Trinity to be “found” in scripture, a person must already have a Trinitarian presupposition. Unfortunately many Trinitarians fail to see this, and continue to point at the use of the terms Father and Son in the Bible as some kind of proof for a Trinity. There is however no logical connection between the two. Simply nowhere in the Bible is God being defined as three distinct, co-equal and co-eternal persons. Therefore, a verse containing some linguistic distinction between Father and Son can never be proof for the theological Trinity. The Trinity is not the same as a distinction between the title Father and Son. The Word of God, who is God Himself and not a distinct person, was made flesh. The Bible speaks about the Father sending the Son, but this is not to present two separate persons. It is the way God distinguishes His eternal Spirit from His earthly manifestation in flesh and blood as the God-Man Jesus Christ. The Father and the Son are indeed two distinct titles or offices, but they are the same person called YHWH in the OT. To separate God from His Word into distinct beings is unbiblical. Some would contend that Jesus prayed to the Father and therefore we have two persons. But why would one heavenly person have to pray to another completely equal heavenly person? That makes little sense. The reason Jesus prayed was due to His role as the Mediator (1 Tim 2:5). Jesus represented the collective will of humanity as He died on the cross to redeem our sins (Matt 26:39). But He rose from the grave by Himself. No other God needed to assist Him (John 2:19). 1Cor 15:47 The first man is of the earth, earthy: the second man is the Lord from heaven. Today scientists are uncovering more and more secrets about our DNA. Their research shows how the human genome has been degrading steadily over the past millennia, accumulating all sorts of mutations and corruptions. They even discovered that genetically, we share much material with animals, especially with the great apes. This makes sense when we realize that all earthly flesh is taken from the same dust (Gen 2:7), and will eventually return back to it (Gen 3:19). In stark contrast, the Bible states that the body of Christ was taken directly from the Word (John 1:14). Jesus obviously never returned to the dust, but was taken up into heaven, which was also His origin. Jesus thus never shared in any of our human DNA corruptions, nor does His flesh have any similarity to that of animals. It would be absurd to believe otherwise about the body of our Lord from heaven! But there are more complications with the “fully human” view. If we are to assume that Jesus took corruptible “Adamic” flesh from Mary, it is difficult to see how He could have been sinless as well. A human is a sinner by definition. And there is another problem. A person can only be considered human if he or she inherited 23 chromosomes from the mother and 23 from the father. We know that Joseph was not in any way linked to her pregnancy. It must therefore puzzle Trinitarians how Jesus can be called “fully human” while He supposedly only took 23 chromosomes from Mary. At best such a being could be considered human-like but not fully human. This is corroborated by the fact that Jesus never recognized Mary as His biological mother. He addressed her as woman, which could be considered very rude, unless we understand that there was no bloodline between her and Jesus. This understanding also avoids the unbiblical practice of attributing some pseudo-divine status to Mary as mother of God or The Blessed Virgin, a dubious practice we still find in some traditional denominations. Today many Christians adhere to the “fully God and fully human” dogma regarding the nature of Christ. What they do not realize is that this dual nature doctrine is not from the Bible at all. It was formulated during the council of Chalcedon in 451 AD. As with the doctrine of the Trinity, we have another case where a pope, many bishops and am emperor are gathered to produce yet another piece of manmade doctrine. It was pontiff Leo I who wrote the letter (called “Leo’s Tome”) that resulted in the Chalcedionian creed. But just as the apostles never spoke of any God the Son or Trinity, they never wrote of Jesus having a human body. It is high time that seeking, hungry Christians start to cleanse their faith from all the confusing doctrines spawn from Greek philosophy and catholic councils! The bottom line is: a corruptible human body cannot be a covering for sin. Therefore, the heavenly flesh of Christ redeemed mankind because it was undefiled and holy, and could not commit any sin. This belief is essential if we want to understand the new birth. This will be the subject of the next part of this letter. There is much confusion amongst Christians about the meaning of the new birth. Often the new birth is equated to “having faith” or “repentance”, but this is not what the Bible teaches. The gospel was not delivered to any Christian denomination, which is obvious from the fact that they all have different teachings about the new birth. Instead, the gospel was delivered to the apostles who lived with Jesus and wrote about Him. So to understand what the new birth is, we must study their teaching only, which is the teaching of the Holy Ghost (2 Pe 1:16, John 14:26). To understand the new birth, we have to understand the apostles’ doctrine. What did they teach? Several important prefigures (types and shadows) of water baptism are presented in the Old Testament. (Eze 36:25-26, 37:1-14, Mi 7:18-20, Zec 13:1, Je 31:31-34, Is 53, Ps 74:13-14). The prophet Ezekiel especially spoke of “clean water” that would wash away the filthiness of sin and idols. The apostle Paul revealed that the covenant of circumcision that God made with Abraham was a shadow of baptism through the death, burial and resurrection of Jesus Christ (Gal 3:8, 16, 29, Col 2:11). The apostle Paul further explains that a form of spiritual surgery takes place when the “old man” is “buried with Christ in baptism” (Col 2:12, Rom 6:3-4), and we have undergone a “circumcision made without hands” when the “putting off the body of the sins of the flesh” has occurred in the waters of baptism. The prophet Micah foretold this when he declared “thou shalt cast all their sins into the depths of the sea” (Micah 7:19). The Bible says that Christ came by flesh, water and blood for our atonement (1 John 4:3, 1 John 5:6). To complete the picture, Paul writes that “for as many of you as have been baptized into Christ have put on Christ” (Gal 3:27). This was foreseen by the prophet Isaiah when he prophesied about the robe of righteousness (Is 61:10), which is the flesh of Christ that is put on in baptism in Jesus name. His words are echoed by the story of the man who entered the wedding celebration without a wedding garment. As he had not obeyed water baptism, he could not enter into the Kingdom (Matt 22:11-14). Mark 16:16 The one who believes and is baptized will be saved, but the one who does not believe will be condemned. In the book of Acts we find the practical application of the Great Commission given by Jesus to the early church. On your website you state that baptism should be “in the Name of the Father, and of the Son, and of the Holy Ghost”. But be aware that Matthew 28:19 is the only verse in the Bible that uses this supposed Trinitarian formula. The apostles however only baptized in Jesus name. Contrary to what some claim, baptism in the name of Jesus Christ is based on overwhelming evidence. It has many witnesses in the Bible. There are at least 5 verses that provide the only correct name to be baptized in: Jesus (Acts 2:38, 8:16, 10:48, 19:5, 22:16). In addition, the apostle Paul only speaks about baptism in Jesus Name (Rom 6:3-8, Gal 3:27, Col 2:10-13, Ti 3:4-7). Sins are remitted only at the moment of baptism in Jesus Name. The reason is that the Name of Jesus is the Name above every other Name, and the Name by which we must be saved (Phil 2:9-10, Acts 4:12, 10:43). Matt 10:20 For it is not ye that speak, but the Spirit of your Father which speaketh in you. The voice that was speaking at the baptism of Jesus (Matt 3:16) was not that of another divine person, but God Himself. God is in heaven speaking as the Father, but at the same time He was on earth in flesh and blood as the Son. Baptism is an act of faith, not a work. Without faith it is impossible to please God. But it is only in the water and through Jesus’ Name that sins are actually remitted and Christ is put on. The apostles encouraged newly baptized Christians to seek and receive the filling with the Holy Ghost, with the evidence of speaking in tongues and prophesying. That is the apostles doctrine, and no one has the right to change that doctrine, not even God Himself, for He cannot lie. The Bible warns that even if an angel from heaven would teach another gospel than that of the apostles, he will be accursed. If someone has told to you that you are born again by reciting the Lord’s prayer or by repenting, that voice or person was not from God. You have been deceived into a false belief. But now the Word of God has come to you. Paul knew of no Trinity, and believed in One God, The Father, who is manifested in flesh as (one Lord) Jesus Christ (1 Tim 3:16). The development of the doctrine of the Trinity and its associated downgrading of baptism into a ritualized act constitutes a corruption of church doctrine. The devil hates and fears the name of Jesus so much, that he decided to corrupt the belief of the early church by bringing confusion. He attacked baptism because the water separates the living from the dead. He attacked the identity of Christ by inventing the Greek philosophy of “three in one”. But we have the Word of God and the Spirit of God. Dear friend, the Word of God has spoken to you now. It is up to you to study these words prayerfully. Please consider this letter and be baptized in Jesus name. Your Christian life or ministry will then take a new turn. If you accept the apostolic doctrine, many former friends and so called Christians will leave you, and you may well become an outcast within the Christian community. It could mean you must start all over again. This is the call that God has for true believers. Choosing Jesus will bring much persecution and personal sacrifice, but you will receive a crown in heaven. It will take wisdom, courage and humility to accept this truth. I would like to encourage you to seriously pray and fast about what I have written to you, and to ask God to confirm this truth. The Lord will answer. Feel free to contact me for more information. Previous PostMore questions for trinitarians!